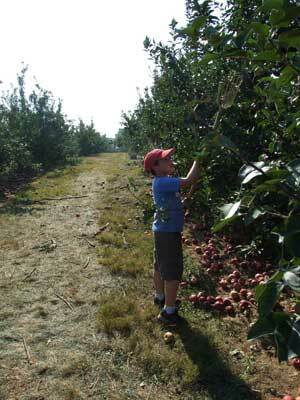 Gus had off from school yesterday, so along with his friend Sam and Sam's mom Sabina, we headed off to Linvilla Orchards in Media to do some fall apple-picking. What could be more autumnal? You'd think in mid-October that it would be a great fall activity, eh? Well, we had a great time, but as the temperature hovered around 90 degrees, it was a little on the Saharan side. 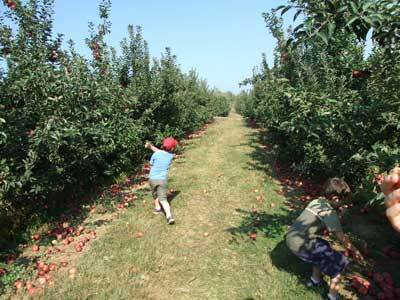 They picked for a while, and then discovered that windfalls are great for hurling. We did the first (easy) one, and then they insisted that they wanted to do the second (difficult) one. 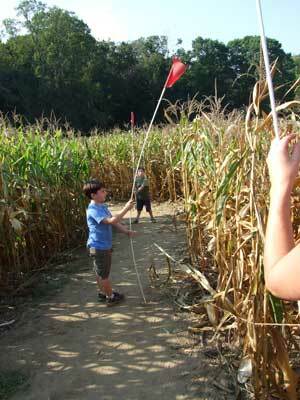 It was hot as Hades in the Corn Maze and at one point Gus fell behind us. I had a teensy moment of panic and started calling, "Gus!" No answer. "Gus!" No answer. (panic rising) "Gus, where are you???!!" Finally, from far away came his little voice, morose and sepulchral: "I'm digging my own grave...."
Now, what to do with 20 pounds of apples???? Hilarious! That boy is funny! Um, apple pancakes, apple pie, apple turnover, apple butter, apple tarts, dried apples, apple chips, apple crumble, baked apples, apple sauce. Anyway, twenty pounds of apples is a small price to pay for a great afternoon with Gus et al. Oooh, apple cider! That seems so obvious, why didn't I think of it? Make something that you can freeze so you can enjoy your apples all winter long! You can also take them to school for the various rabbits and guinea pigs and such. What would be the "and such"? The peach cobbler recipe can also be made with APPLES!!! And it's SOOOOOO good for you. I don't know all the critters that they have in that ding-dang school, but I think they can all eat apples!